Most definitely you’ve ever created big websites, right? 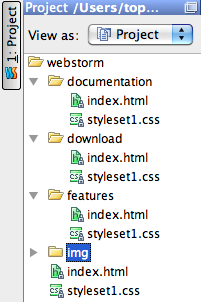 Then you might have opened more than one index.html, index.php files in the editor. How to tell one from another and understand which part of your website they belong to? 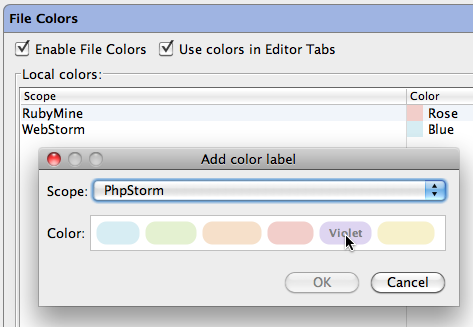 WebStorm/PhpStorm help you make files with similar names stand out at a glance: press Ctrl+Alt+S / ⌘ , to open the Settings dialog, and choose File Colors. Enjoy! And be sure to let us know if you like this feature. This entry was posted in Cool Feature and tagged productivity, UI. Bookmark the permalink. And direcrories src, tests and lib has different colors? @MaziLLa: you just need to define scopes appropriately. They should allow you to configure what you want. Извиняюсь за назойливость, но попробую сформулировать проблемму на родном языке. У меня есть папка /www/project/ – это мой проект. И есть папка /www/lib/ – это некие библиотеки. Как видно, lib НЕ является подпапкой для project. Но lib подключен к project через Settings->Directories->Add Content Root. 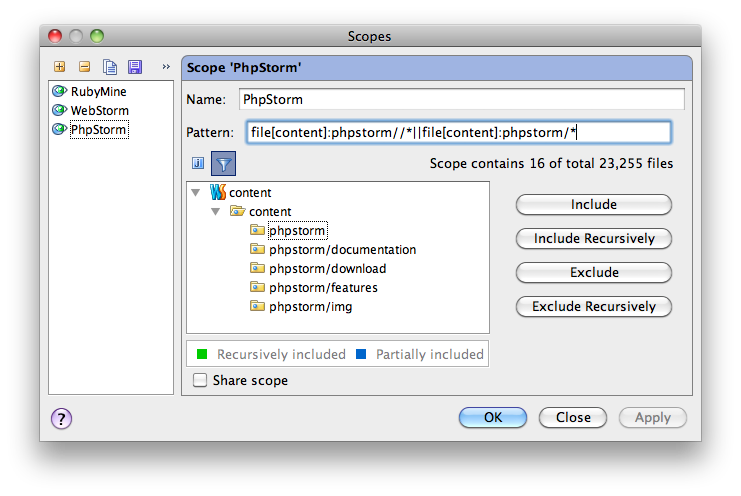 При этом, в диалоге создания Scope, когда я выбираю lib и жму на Include Recursively, PhpStorm добавляет в текущий scope обе папки: и lib и project. Pattern: file[project]:*/. То же самое, если нажать Exclude Recursively – исключаются обе папки, но выбрана при этом только одна из них. It is not possible to distinguish content roots now. If you can place your lib in “project_libs” direcory then scope file:lib//* would work. Or you can enumerate your libraries one by one.